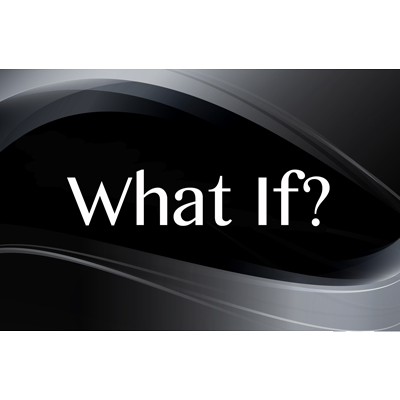 People wonder about the “what ifs” in their earthly lives, but are they wondering about what will happen to them in eternity? This tract will get their minds moving in the eternal direction by engaging them with simple questions that lead them to the right answers! What if all of your dreams came true? What if you could live forever? What if you had six months to live? What if you were breathing your last breath right now? 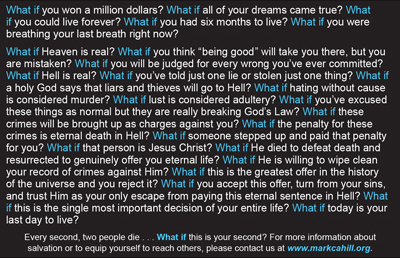 What if Heaven is real? What if you think “being good” will take you there, but you are mistaken? What if you will be judged for every wrong you’ve ever committed? What if Hell is real? What if you’ve told just one lie or stolen just one thing? What if a holy God says that liars and thieves will go to Hell? What if hating without cause is considered murder? What if lust is considered adultery? What if you’ve excused these things as normal but they are really breaking God’s Law? What if these crimes will be brought up as charges against you? What if the penalty for these crimes is eternal death in Hell? What if someone stepped up and paid that penalty for you? What if that person is Jesus Christ? What if He died to defeat death and resurrected to genuinely offer you eternal life? What if He is willing to wipe clean your record of crimes against Him? What if this is the greatest offer in the history of the universe and you reject it? What if you accept this offer, turn from your sins, and trust Him as your only escape from paying this eternal sentence in Hell? What if this is the single most important decision of your entire life? What if today is your last day to live?